Now There’s Spam Text Messages! We all know about spam email messages, but now we also have to deal with spam text messages on our cell phones and smart phones. We live in an increasingly technological world, and having an email address and a cell phone is almost de rigour. For our computers and email, we have spam filters, we buy software to reduce spam messages, and at work we have firewalls that can help block spam. But the newest version of spam is spam text messages. They’re a growing problem throughout North America. Spam text messages are on the rise because of unlimited texting plans, and due to the availability of cheap disposable phones. It allows text message spammers to changes phones and phone numbers frequently and easily. This makes them difficult to track down, and difficult to prosecute. Most spammers are sending the spam from the Internet, and not as text-to-text or phone-to-phone messaging. Nor is there currently good software or infrastructure to identify, limit or quarantine spam text messages as there is for email messages. Cell phone companies are continually trying to develop spam blockers, but spammers also continue to find new ways to circumvent this technology. The problem with spam text messaging is that it can cost you money if your cell phone plan does not include text messages. But even more of a problem is that these are phishing scams which are designed to steal your personal information. 2Ascribe Inc. is a medical transcription company, located in Toronto and providingtranscription services across Canada to physicians, clinics and other health care providers. 2Ascribe continues to implement and develop technology to assist and improve the transcription process for physicians and other clients. 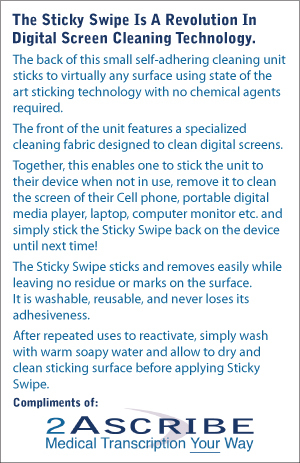 To receive your free “sticky phone cleaner” email info@2ascribe.com or call 416-503-4003 (limit of two per person; time limited offer, subject to availability). This entry was posted on May 28, 2012 in Business.